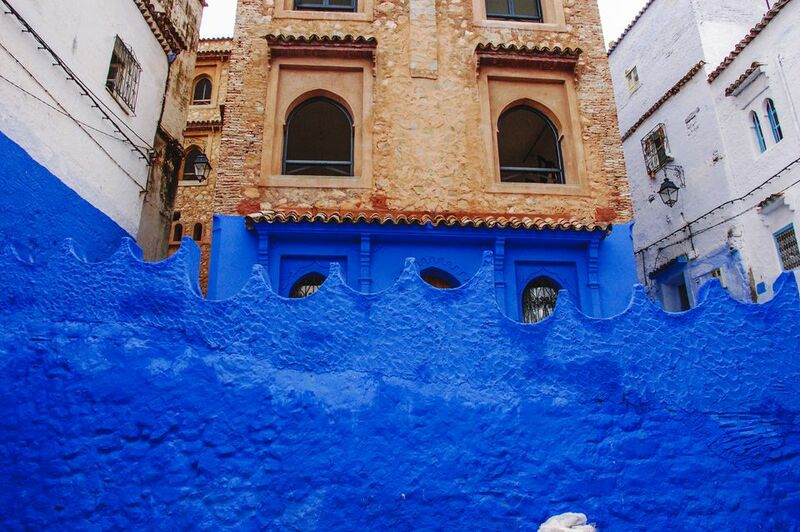 Chefchaouen is situated in the heart of Morocco's Rif Mountains. Chefchaouen (sometimes called Chaouen) is relaxed, with very affordable accommodations, and above all, quite stunning to look at. The streets and most of the buildings in the old part of town (medina) are painted a most brilliant sky blue. The mountains which you can see at the end of every cobbled street are rugged and majestic. The clear mountain light just adds a magical touch to the place. 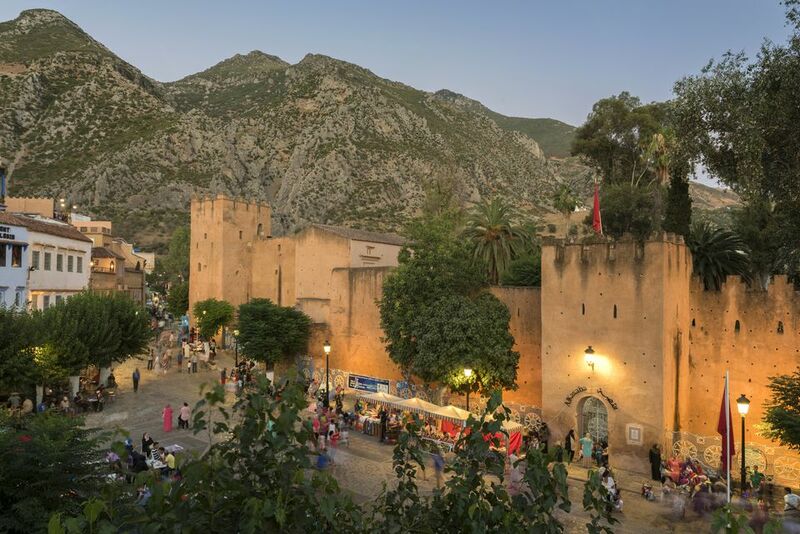 It's no wonder that Chefchaouen is a favorite destination for backpackers visiting Morocco (and it's not just the readily available supply of ​​hashish). The main square in the medina is lined with cafes and filled to the brim with locals and tourist mingling easily. The Plaza Uta el-Hammam is the heart of the medina. This is the spot to take a break, drink some mint tea and watch the world go by. Restaurants and cafes line one side of Plaza Uta el-Hammam with views of the Grand Mosque and the walls of the medina. In the late afternoon, locals and tourist gather in the square to chat and watch the world go by. Food stalls are set up as the sun sets, offering all kinds of delicious snacks. The restaurants and cafes offer traditional Moroccan fare as well as western food. The Rif Mountains offer wonderful day hikes for visitors. Your hotel or pension should be able to organize a trip for you with a dependable guide. The Rif Mountains is where most of Morocco's marijuana is grown, so be careful not to stray too far off the path. Chefchaouen's old city, as in all​ medinas in Morocco, is surrounded by walls, originally put up to defend the town against invaders. A jellabais is worn by both men and women in Morocco and is traditionally made of cotton and silk or wool. The garment is worn over regular clothes and is worn outside the house. Most jellabas have a pointy hood which is worn to keep warm as well as cool in the sunshine. The medina (old town) of Chefchaouen has a very relaxed atmosphere. The brilliant blue hues that cover the walls, streets make it quite unique. Most of the streets and many walls in the medina of Chefchaouen (where you should be spending most of your time) are painted blue. It's a lovely sight, especially in contrast with the peaks of the Rif Mountains. It was the Jewish population that started the blue trend and transformed the look of the town in the 1930s. To this day it is not uncommon to see ladies with big brushes freshening up the blue paint outside their homes. The narrow streets of the medina are filled with cozy restaurants and shops where locals mix with tourists in an easy manner. You can't get lost since the town is really not very big and most of the larger alleys will lead to the main square: Plaza Uta el-Hammam. The narrow roads inside the medina can get quite steep, so if you aren't very fit, or have difficulty walking, remember to take it easy. Henna is used to decorate the hands and feet usually for weddings, festivals and other special occasions. Henna has traditionally been used to decorate the hands and feet during weddings, festivals and other special occasions. The powder (made from the henna plant) is mixed with water to produce a paste. Usually, the henna is painted directly on to the hand or foot in intricate patterns. In these modern times, there are also ready-made stencils to use that are imported from the Middle East. When you visit Morocco, it will be easy to find a henna artist to decorate your hands or feet if you'd like to try it. The pattern will usually stay on your skin for 1-2 weeks before fading. If you like trinkets and souvenirs, you'll love what's on offer in Chefchaouen. The shopkeepers are laid back and the bargaining is easy. Chefchaouen is a dream to shop in especially if you're on a budget. There are loads of little stylish handbags, lampshades and loose cotton clothes to enjoy. If you're looking for a carpet or something more specific, you'd be better off shopping in Fes or Marrakech. Shopkeepers in Chefchaouen were very laid back and I enjoyed the fact that their starting prices were much more reasonable than those I was ever offered in Marrakech. So, if your bargaining skills aren't too sharp (mine are decidedly not), Chefchaouen is a good place to shop. If you're looking for a hotel in Chefchaouen Casa Hassan is an excellent choice as a mid-range price option. The staff is extremely friendly and very genuine. The rooms are all uniquely decorated. The hotel is situated in the heart of the medina and is an easy walk from the gates where the taxi will drop you off from the bus station. Across the street from the hotel is the Restaurant Tissemlal which has the same owner as the hotel. The price of the hotel is very good considering two meals at the excellent restaurant are included. Traditional Moroccan food is served in a wonderful atmosphere with an open kitchen. Getting to Chefchaouen is easy, there are daily buses to and from Casablanca, Tangiers, Fes, Meknes, Tatouen and Cueta (Septa). The CTM bus company has an office in the main bus station which is situated down the hill from the medina in Chefchaouen. You can purchase tickets in advance to most destinations within Morocco. It takes about 4 hours by bus from Fes and Meknes to Chefchaouen (and costs around 70 Dirhams). It took us just 6 hours to get from Chefchaouen to Casablanca (there's only one bus, leaving in the morning). Private bus companies run to most other destinations not covered by the CTM company, and most drivers and owners will be milling around the main bus station. Get to the bus station in the morning for most departures. A Tagine is a traditional Moroccan cooking pot. The dishes served in the tagine are delicious -- you have to try it when you visit Morocco. Most small hotels include breakfast in Chefchaouen. Simple fare is usually some French bread with jam. Snacks are readily available all over town and there are a couple of good bakeries. Chefchaouen has several very good restaurants, including the one run by the owners of the Casa Hassan, the Restaurant Tissemlal. Other recommended restaurants in the medina include La Lampe Magique Alladin and the ​Restaurant Assada ask a local person to direct you. Restaurants tend to not take reservations, so get there early if it looks like there are a lot of tourists around. Early dining in Morocco means around 7 p.m.